Although the photo shown here was undated, I am assigning 1910. A photo from the Cline Collection at Northern Arizona University is dated 1915. In it, the buildings in downtown Ray appear complete but otherwise the visible structures are quite similar. So, I assume, some but not too much time has elapsed. (S)Steps, with handrails, from downtown to some residences. The residence may have a tin roof. The windows have drop down shutters. 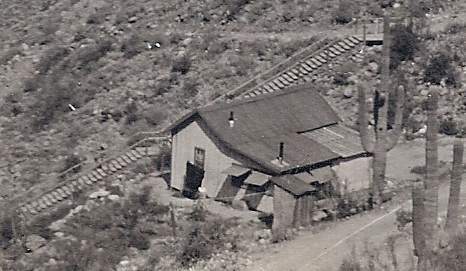 And several outhouses are seen; in this clip-nearest the camera. (MC)Mineral Creek flowed most, if not all, the time. I highlighted it in blue. 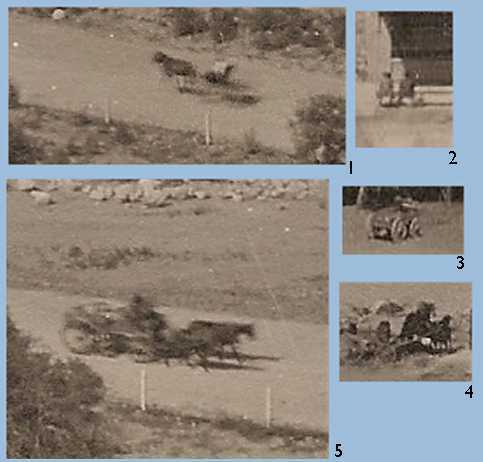 (L)There are several instances of horses and people in the panorama. Numbers 1 and 5 are on the broad road to the left (downstream) side of town. The others, 3 and 4, may be just standing. The two gentlemen sitting on the bench (#2) are downtown. Several other people are visible downtown-mostly workmen laying brick or roofing. I didn't see anything resembling people in the mine areas. (H)I am pretty sure this is the hospital building. Other contributors seem to agree. (W)This is Sonora. Visible is the church (in town). 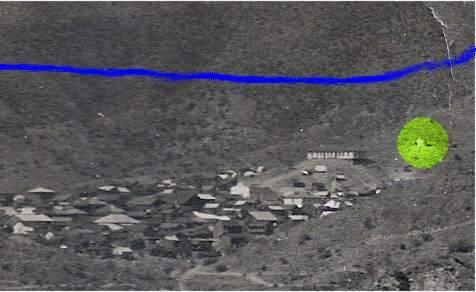 The colored dot points out what I believe is the water tank still visible from Highway 177. The colored line is my approximation of the location of the highway today. (T)Some text is readable. The Hub may be a tavern. There seems to be a false front on the back(?) which is at Mineral Creek's edge. 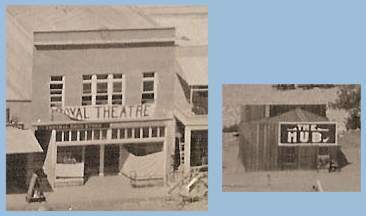 The Royal Theatre sign may be paper? The Boston Store sign is unreadable here but on the Cline pictures it is readable. The Miller Bros. Merc. Co.* is quite visible in the Cline picture. A Bull Durham tobacco advertisement was added by 1915.